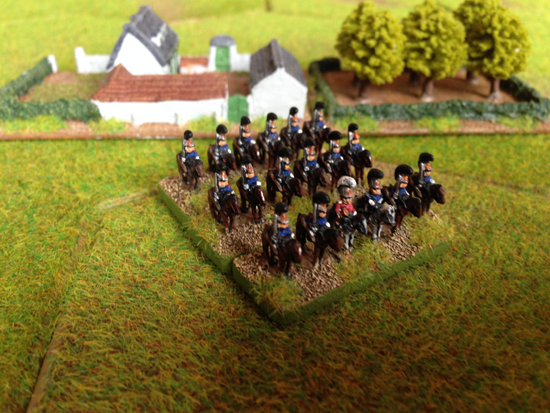 A quick guide to how I painted my 6mm 2nd (Belgian) Carabinier Regiment for Waterloo using Baccus Russian Cuirassiers (NRU7). Note that the Russian command strip contains a standard but I could find no informaion that one was carried by Dutch-Belgian cavalry at Waterloo - so I replaced this figure with a normal cavalry trooper. Paint the jacket, shabraque and valise. Paint the hair and carbine. It doesn’t matter if you paint the hair too wide and cover part of the helmet. Epaulettes. As the Russian Cuirassiers do not have epaulettes, these must be painted using your imagination. The trumpeter had reversed colours (red jacket with blue facings), white epaulettes and a white crest on the helmet.